Practice Fusion Reviews Recently Reviewed! Pros: When we were opening our practice almost a year ago, there were 3 main EHR platforms we were considering. After the demos and in-depth trials, we ended up choosing Practice Fusion because of the clean interface, ease of use, add-on features, and integration options. We felt that Practice Fusion would allow us to customize our EHR system over time, building and adding only what we want. Having used Practice Fusion since beginning our business, we have been really pleased overall. It serves all of our current needs and has helped our practice run smoothly and efficiently. Practice Fusion is convenient to access online, has useful templates for charting, is intuitively navigable, and produces documents/reports that are clear and professional in appearance. Practice Fusion has been a great fit for us so far. Cons: I would say that the main issue we run into with Practice Fusion is subpar customer support. While there is an option to chat with a live representative, the wait time can be excessive. When I finally connect with an agent (if I haven't moved onto something else and forgotten about waiting), the quality of the help that I receive is hit-or-miss. Also, there are a couple of minor things that I am hoping will be addressed (being able to search for patients by nickname/preferred name, documenting meds that have been called in vs. sent electronically, etc. ), but no EHR platform is perfect and Practice Fusion is definitely the best system I have used thus far. Overall: Working with Practice Fusion has been a positive experience overall and I can't imagine what our first year in business would have been like without it. The last thing any practice wants to worry about or have issues with is is an EHR platform. Practice Fusion has been a solid system, allowing us to operate effectively on a daily basis and focus on growing our practice. The cost is definitely worth it (even though it was free when we started!) 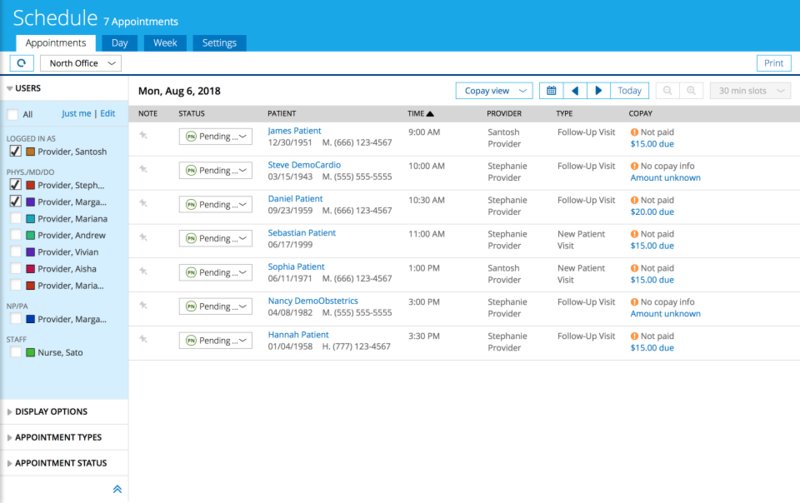 and Practice Fusion is by far one of the best EHR platforms available today. We won't be switching EHR systems anytime soon. Comments: This software often felt way too busy and clunky for my needs. I started shopping for software specifically made for mental health. I test drove a bunch of new software programs. Simple Practice was my choice. It does everything I need at a price I can afford. It is also very simple and intuitive by design. I can accept credit cards and conduct HIPPA-secure tele-sessions through the site. They offered an easy way to do mental status exams and treatment plans. Not so in Practice Fusion. Pros: It allowed me to use it at no charge for many years. This was helpful for me as a solo practitioner with high overhead costs. Cons: This software is not built with mental health in mind. There is no way to customize the interface for the specific needs of my occupation. There were a lot of annoying pop-ups that I had to deal with that did not apply to mental health providers. The most frustrating thing was attempting to work with the calendar. It was impossible to review my schedule on my mobile phone because the calendar was not optimized for mobile. Another feature that did not work well was the client search feature. No matter how many times I would type in certain clients' names, the search box would not recognize or find the client. Also, there was no quick way to add a client unless I had all of the pertinent client data on hand. Most solo MH providers are wearing all of the "hats" in the practice and are trying to schedule new clients during the one or two minutes they have between sessions. Sometimes all we have to go by during that time is a name and contact number. My biggest complaint is that client data cannot be exported via CSV or Excel format. This is a big issue when you have to change software. Pros: Little lag, reasonably cohesive interface, easy enough to use once you gett over the learning curve. Cons: Poor support which relies on the Practice Fusion community of users to answer questions for each other, no voice mail reminders to patients, difficult to find correct documentation for MIPS and not notified when info changes. Overall: It was a good introduction to an EHR for a new and growing practice, when it was free. Now, at the new price point, it is not nearly the same value in comparison to it's competitors who offer integrated billing at the same cost, voice mail reminders, better product support instead of relying mostly on it's user-generated fourums, etc. Pros: 1. Providing good features ( Schedule including online booking, Patient demographics, management documents, E Prescription, Insurance and verification, Immunizations, Allergies, Smoking status, Vital sign, customized templates, Referrals, lab order and receiving results, image order and receiving results, Soap Note, Message, Patient portal and MIPS report) for free. 2. Providing free learning center in Practice Fusion EHR system. 3. Providing a free custom service ( with Phone, Email. Message, Online chat). 4. Providing report for regulatory compliance and qualify for CMS incentives. 5. Practice Fusion provides Cloud based EHR system. So, you can access the EHR system at any time from any places including out of county if you have internet access. 6. HIPAA, ICD-10, CPT, HL7 compliance and ONC certified. 7. Practice Fusion EHR system is easy to learn with very good navigation design. 8. 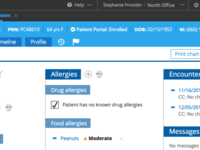 Practice Fusion provides some of useful reports ( Patient, Chart notes, Diagnosis Drug interactions, Allergy interaction, e-Prescription per provider, Medication, Patient lists, Referrals, Appointment, Payer, and Activity feed and audit report). Cons: 1. Practice Fusion has no billing management feature although it can been integrated with other billing software. 2. There is Payer list problems with payer codes, and custom service staffer don't know how to solver the issues. 3. Practice Fusion don't provide our own account manager, we have to explain our issuers each time when we contact customer service representatives. 4. We don't have any communication channel with up level staffer and technical engineer. So, when we have technical or want to have better features, we are lack of connection with Practice Fusion EHR desire team member. 5. Because Practice Fusion is free, the integration with labs and image centers are limited and slower. 6. Practice Fusion doesn't provide onsite help, and there are no regional help centers. 7. Lack of billing feature is a good issue. The processor of integration is completed and have a lot of issues with billing software companies. 8. Because of the billing issue, there is a problem to meet the cost requirement for MIPS from CMC . 9. There is no upper level help staff available in Practice Fusion Customer service. 10. Practice Fusion only provide limited reports. There are no billing and financial Reports. Such as, daily, monthly, yearly receivable and revenue reports. 11. We hope Practice Fusion will provide its own billing system for us, and we are willing to pay for the billing service. Comments: Make this open source so that providers can add functionality to their system. Retain your revenue through advertising as you are doing, from labs, pharmacy, radiology connectivity but give assess to tweak simple issues. Then you would truly be the leader so sought to be. Pros: Free, able to get up and running in no time. Web based. runs on both desktop and tablets.free to the provider. Cons: Simple tweaks that need to be done are completely neglected. Absolutely cannot talk to support. Difficult to have patients register and if you run a walk in clinic which most places are then forget it. Be ready to type in every last digit yourself. They tout integration with labs, pharmacy and radiology but only those integration to make them money and really i do not care, they should be profitable to remain in business but don't make me use to your product and when you have issues they throw it to a " crowd voting system". As a user i had never even realized that a voting system existed and as a busy provider i do not have the time to read through to find some fix i need already reported. How silly and draconian, who ever came up with this idea needs to be fired!. The founder definitely has no more involvement with this software otherwise he would have seen that no support and inability to adapt to simple tweaks leaves a horrible last. DO not use because you will have trained and gotten used to this and then issues would arise as they always do and you are faced with looking for another. No integration with billing software and this is why. A list of billing companies are given as partners but communication is one way. The super bill flows into the billing but no way to know what a patient owes when they return . There are lots of free clearinghouse but PF in their infinite wisdom will not integrate. Comments: Given that it's free, I don't feel I have the right to complain too much, however, customer service has NEVER been a strong suit in the 3+ yrs I have used PF in various settings. I live in MI and don't understand why I can't yet e-scribe controlled substances in my state when other EMR's have been for quite some time. Having to create emails for more than one practice is absurd because then you have to remember all those emails should you ever need to reset certain things. I have made a few recommendations over the years and none of them were, I guess, important enough to consider. Lastly, the fact that you can't get rid of test results that were sent to you in error makes it look like you have more unfinished business in your EMR, and there have been no easy fixes to this. The one fix I was given I don't even remember because it would require triple the time to get rid of them from my account, and this just isn't a priority with me right now. It fills a need right now, but I am having to look for another EMR just because it's not meeting my current needs in all levels. Sad to say, but it's too bad this can't be fixed. Pros: That it's free, fairly easy to use, but not always simple. Has gotten better over the years. Cons: when creating a superbill, often sends a message "fix validation errors" before you can save as ready to bill, but no errors are listed or highlighted......WHAT DOES THIS MEAN?!?!?! The only solution I have found, to date, is to go through and start erasing diagnoses, one by one until I can save. Then, I know I am losing revenue because I have had to erase so many! Also, not being able to save partial info (name but no bday) means you can't save a few steps ahead and make it easier to begin with a new pt....or partial insurance info until you can actually get/see a copy of their cards. Medication interactions are often incorrect or marked as urgent yet when I contact the pharmacy, they don't have the same interactions listed on their system to worry about....and those stupid yellow drop-down reminders do nothing but get in my way. Searching for new pharmacies is sometimes difficult because it won't bring up the correct one. Recommendations to other buyers: If resources are limited and your budget doesn't support another EMR, this one will do fine, IF you don't need regular help from customer service. Pros: It used to be free. Ability to make your own templates. The E prescribing was simple to use. Easy to enter lab orders and lab result integration was good. Cons: From free to the whole amout annually paid in advance. The price increase has shut out many small solo practices. The cost is for one physician license +3 additional licensed employees. Wouldn't cost be much fairer if the cost was truly per user. I don't want to subsidize larger offices. Horrible customer service since late last year. The templates that are provided are a very low-quality including lots of misspelled words. New spaces for LGBTQ data but nothing for advance care planning and limited space to provide emergency contacts. Not very user-friendly for documenting geriatric patients. No structured section for preventative care with reminders when overdue. Immunization section was not updated routinely: new herpes zoster guidelines. Making a lab result flowsheet was terrible. Everything was à la cart: needed a separate clearinghouse for billing, needed to purchase up docs, etc. Hopefully they'll come up with a different pricing structure. Gone elsewhere for now. Might return if cheaper, charge people for using MIPS separately. Why should I have to pay for all the tech development of features that I don't use when basic items are missing? Comments: Great value for the price. We are just starting to implement the patient portal and find it is another useful tool for some patients. Pros: We love the price, as a small office (2 providers) our budget was limited and this was appealing. I knew other offices larger than ours that used it and they recommended it as well. There is a lot that Practice Fusion is capable of and I think we are only hitting the surface of how it can make our jobs easier. I really like how updox (faxing system) coordinates with Practice Fusion and we can upload what we need into the chart so easily. Cons: I felt it was difficult to navigate Practice Fusion, but then when we started using it I was also setting up a private practice so that made things more difficult because I really didn't know what I needed as far as intake templates and how to set up my notes to make it quick and easy. After some tries I think we are doing pretty well. The only thing I wish was different (and maybe this can be done and I just don't know how) is that I could duplicate the previous note on a patient and then I can see in one glance what was discussed at our last appointment and then type the new note over the last note. I list their current medications and past medications at the top of the subjective section and so if this could be brought forward on each additional note then all I would need to do is make changes as the occur and not have to keep a "master" word document that I have to update and then copy and paste. Comments: I think of it this way. It has been free for so many years. I have participate Meaningful Use before and got incentive payments. That means I even made money without investment. In general, I don't blame the previous owner. I guess when it was difficult to continue the business as is, there has to be a change. Pros: I customized templates myself to optimize the charting workflow in the past. It was much more efficient and accurate than the new EHR I just started to use (1/4 of time). I only need charting and billing for exam payment before. Now I need dispensary and manage inventory, I have to use a full EHR for OD. It was just about the timing PF stopped offering free version. So I didn't use the paid version. I can still view my previous charting and appointment records through PF. That is good. But I was a little bit frustrated with new way of maneuvering through charting. I even debate keeping both EHR to give myself peaceful mind. Cons: Obviously not free anymore. Free forever? I didn't even believe it from the very beginning. It sounds right to get paid by advertisement. But, it is not something that is sufficient and guaranteed forever. Pros: This software is a breeze to teach to new and existing employees alike. New features are few and far between but seem to be easy enough to implement. Software use to be free which was a real pro but the cost is not outrageous now. We are hoping that with the cost per provider, we will be seeing some feature upgrades that will make it more of a time-saver. Pros: The software has been easy to use. Until now most of my questions were answered in a timely fashion. Overall: It serves as a nice EHR for our Physician's practice. Also i got valuable help from the PF technical support team when i was trying to integrate this EHR with our billing software Kareo. Comments: Happy with the EMR up to 2017. I don't feel it will meet our needs for QPP reporting. Pros: This is a free platform for medical offices. There are no hidden charges and it is easy to use. Cloud based, so you don't have to invest in servers. Easily link lab facilities to send and receive orders/results electronically. Cons: I don't feel they are ready for CMS's quality payment program. We are already in June and don't have a dashboard for the Advancing care information (old meaningful use) yet. We need to gauge how we are meeting each measure before the start of the last available reporting period. The Quality measures (eCQM) are only geared towards primary care and we are a specialty with a specialty measure set. I have to connect with a Specialized registry to be able to report quality measure, and the data files are not adequate to download a CCDA file, so I may need to input ALL the data manually to be able to report and to get credit for the bonus points. We may need to switch EMRs if things stay the same. Great software when it was free...not so good if you have to pay for it!! Comments: Not a bad software package, but it has its limitations. Customer service has deteriorated over the 7 years that I have used the program. You generally never can get a live person to discuss the issue. Everything is by email. If I have to pay for software, I will find one that does everything I want. Pros: The software is easy to navigate and has the basic features of an EMR. Being cloud based, it was easily accessible from any internet based pc. It was practice specific in many ways, with certain shortfalls. Vaccine inventory was very good. Cons: As a pediatrician, I must record a patient weight in pounds and ounces, which you can't do with practice fusion. The basic templates can not be modified and you had to be careful when composing notes (I don't come across too many 2 month old infants with teeth!) either not to pick those elements or go back and really proof read the notes. Log in from a machine that you didn't use previously is a nuisance, in that you have to be verified with a security code. Pros: I'm so happy they finally allowed us to add a sticky note to patient's charts. It was very difficult to have communication between departments to notify other members of the staff of patient needs. It is very helpful that it interacts so well with Kareo's Billing Software. Cons: This program is a little clunky. In the last year they have been making improvements to the usefulness of the system for interaction between departments but there is still a great deal of room for improvement. The reports function is still a work in progress and leaves much to be desired in the information provided and the ease of finding information needed to monitor the flow of a practice. Overall: You get what you pay for. We started using Practice Fusion when it was still free. Since they started charging for it, it is has had several upgrades that are really improving the workflow. There are still many things I would like to see change, but for what it is, it's a reasonable software. Pros: Robust EHR. Excellent engineers with simplicity for user. incredibly bright tech support & helpful in problem solving. Cons: Very weak customer service & tech suport. Charts need to be closed & often problems arise with no resolve before signing. Growing company must ramp up this vital aspect of their company - not ready for public offering without this vital component. Recommendations to other buyers: Listen to your customer base. Simpler moves - the less clicks to get to the desired location of the chart, the better to save time for users. Give users Indefinite fonts, ability to label our own category in the PMH - Past Medical History & ability to send this to other providers. I'm currently at the AMIA conference - American Medical Informatics Association, being held across the street at the Hilton from Practice Fusion. Their engineers should be here with other vendors listening to issues with EHR's. I spoke highly of PF & showed our customized Flow Sheets & Customized labs to other users both medical and Informatics scientists & they were very impressed. PF skilled techs helped us create this, which we greatly appreciate. 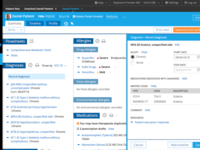 Still need tweaking to make it great, such as providing reference guide of those labs, ability to add both columns & rows like excel for providers to add notes of social behavior connected to all vitals, labs, as you have given to the blood pressure readings only. iE added medication, lost job, divorce, death in family, moved, which will correlate with the change in their labs or vitals. More ability to place in our own word live templates - Family history, vaccinations. Excellent value EHR that meets Meaningful Use! Pros: Please read my review, I just did all this. Cons: Please read my review, I just did all this. Overall: Pros: It's free (so far), intuitive and easy to use, lots of help links and webinars, good flexibility in creating templates, good variety of templates already available, very good support that is responsive in a timely fashion, good reports that work for CMS ehr incentive program and meets Meaningful Use, database is managed off site so helps with some of your security responsibility. Cons: Database is off site so slight delay in accepting and processing data (not bad because entering data is done through a "static" version). Needs more functionality (company seems to be open to changes and asks for suggestions, but slow to implement) - too many clicks for certain features which delays data entry. Recommendations to other buyers: Please increase functionality so speed of use gets faster. Still too slow to use as I want. Too many clicks, eg. - have to go back to Task view to open each chart. Should be able to open 5 or 10 charts at a time in one screen and then move to next screen rather than software forcing you to go back and forth. Pros: Cost is probably the biggest benefit with this software. Even after Allscripts bought the company and implemented a monthly subscription fee, it is still a good value. It does the basics well as long as you don't need any customization. Very easy to setup and get started. Moderately intuitive to navigate. If your imaging center or lab is listed, connecting to them is a breeze. Decent patient engagement included. Overall, it does what it needs to, and what it does do is easy to use. Cons: Pretty limited in terms of what you can do. Navigating a chart or visit and documenting information isn't the most intuitive or well laid out, though the interface is clean. If you need any extras, plan on spending more than the base cost to implement partner products (ie updox for faxing documents). Overall: Started with PF when it was free and have continued to use in a small research based practice. Would not be a first choice for a full-fledged EHR in a busy practice but serves a good purpose in a low-volume setting. For our 2 person practice, this software allowed us to become electronic and meet all requirements. improving itself. We also started using other vendors we learned about from Practice Fusion like Updox which is an electronic fax program. Cons: most of our large labs and all of our radiology do not interface with Practice Fusion so the paper copy needs to be scanned and put in chart. Overall: It allowed us to become electronic at no cost and provided us with the means to meet all the governmental requirements and receive incentives. It is cloud -based so we can access our records from anywhere - it's useful when we are on call and can review the records. We have most of our patients request electronic refills which is much faster than any other way to prescribe and patients appreciate that their prescription is already at the pharmacy. It also allows you to make your own flowsheets to individualize your records. I recommend it highly. Pros: It is web based EMR. Our office found it easy to implement. It is great that any computer with internet access can be your work computer. I compared to other EMR's - it as a clean modern interface. It is built to get you meaningful use and other quality measurements. It is completely free to use, so you can try it out. The support is also superb - chat support is better than phone support most of the time. Our office productivity has gone up after we implemented it, something I have never heard about another clinic after implementing an EMR. Cons: I wish I could eRX narcotics in California. I wish there was a view that had in order all the things that as happened: refills, encounters, messages, documents. I also wish in the summery view there was a pane for tasks in the patient summary. Technical issues takes weeks to months to fix or never get fixed at all. Pros: It was free and user friendly. Very basic and simple EHR for a start up or small practice. 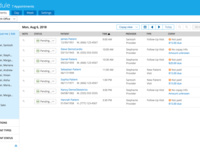 Best features are cloud based, online scheduler, email reminders, and pinned notes that was just recently added. Cons: Not customizable, poor response time on fixing IT issues. Sometimes issues never get fixed at all. Cannot modify online booking time slots. If a new patient books online it will automatically default to 30 minutes. We need an hour for new patients and this created many overbooking issues. Cannot print multiple medical records or super bills at once. I have to go to each visit and print them out individually rather then choose a date range of visits. Very time consuming. Cannot search patients by phone number. The appointment reminders do not interface with google calendars, therefore when patients received email reminders from practice fusion, the time would be off one hour confusing the patient. I absolutely LOVE Practice Fusion! Overall: I bought another EHR a few years ago, but after training, it was still hard to use, so I didn't use it at all! I tried 3 different EHRs, but if was Practice Fusion that was the easiest and the friendliest. I started using PF full time 1 week after playing around with it and watching a couple of training videos on the site. I've introduced my colleagues to PF, and many of them are using it now. I even "train" my friends who want to use PF to make it easy for them to start! A lot of my friends refer to me as their PF IT! Comments: This is a wonderful system and I love it - unfortunately as owner of my clinic and having a prescriber work for me the system does not officially allow for this so I had to call and was instructed how to sign on as administrator/owner I would hope in the future that they change this and add in more therapy practitioners as participants as well. Cons: No button for Social work the way things are printed out is limiting If a note is populated you can not always delete it - even thought you did not see the patient - if you check them in by accident and go back and fix it - it still generates a note that you can not delete. Pros: I love that this product can be accessed from anywhere at any time on any computer with an internet connection. It is very easy to use and easy to customize. I find that the ease of customizing the software is one of the best features for myself as a chiropractor using a software designed for medical doctors. Cons: I wish there were more reports including patient demographic reports. I have a separate billing company, so I have not been able to combine Practice Fusion's features with a billing software yet. Because of that, when I want a patient list for a mailing or something similar, it is not easy to do unlike running some of the other reports that are built in. Comments: This partially forced takover is unfortunate for those of us trying to reduce cost for our patients and provide better care. All scripts is solely interested I couldn't be less interested in All scripts. I'll go back to paper first. Pros: Formerly free - relatively simple and easy to use. Now not worth the monthly cost - not even close. Cons: Practice Fusion sold out on a promise it would always be free. After investigation, I learned why and understand ie. Govt legal issues expecting to cost millions. Having had many EHR/EMR over my 30 yrs practice, All scripts is needed of worst companies to deal with. Horrible support now evident with Fusion, click crazy environment. Uncertain what changes will occur with Fusion. Comments: Once your new user status is up, and the likelihood of you switching EHR's is very low, there will be no support, and no accountability. With ever changing regulations, payer policies, clinical guidelines, drugs and technologies on market, certification requirements and on and on, do you really need to worry about how your EMR is going to force another change on your practice and livelihood. Cons: Labs do not get attached to referrals. As a Nephrologist immersed in lab results, this is a key function for me! When remedy ticket is created, the representative talks in circles, sometimes taking a week to reply. One rep finally acknowledged this was a known issue. One year later, I contacted cust service to request a full data extraction to migrate to another EHR. Same run around. Tried the live chat, no one came to chat, not even a chatbot. Tried the service phone line. Following prompts for "patients and providers with accounts", the recording directs patients to their providers, then disconnects without even addressing provider issues. Tried a different prompt on customer service line, placed on hold by recording, then a live person comes on just to put me on hold for another 5 minutes before I get disconnected. The direct messaging function for other PF users stings. The messages or attachments cannot be recognized as a consult or lab result etc, only as message. lab or imaging orders that are still outstanding do not produce alerts. No shows do not produce alerts. Billing issues do not produce alerts. These factors make PF a glorified blog with minimal extra functions rather than a true EHR. Their attempts at assisting in clinical decision making fails. It is geared mostly for primary care physicians. ex: If the patients last BP was suboptimal, there will be an annoying banner to tell you the last BP was suboptimal. I'm a Nephrologist, patients with easy to control BP do not get referred to me, I don't need a distracting banner for this, or to remind me to ask patients if they have urinary incontinence, or screen them for HCV. You can bank on a reminder to screen for lipids when they get an advertising account from a statin maker. The fact that their previous CEO advertised that "PF is free and will always be free for providers", and now they are charging a monthly fee or will hold your charts indefinitely should tell you that PF is not a company to be trusted. There is a high likelihood of future drastic changes in cost or service since many clients are captive by the difficulties of changing EHR's. I've been using Practice Fusion for a little over a year and I'd have to say it's so easy to use. Pros: What I like most about this software is the navigation. Out of all the other EHR softwares, I grasp quickly to the ease of use. I like how the schedule, charts, task, messages etc. are layed out. It's a great EHR for first time Medical staff such as Medical Receptionist and Medical Assistants. Cons: Well no EHR software is perfect but I can honestly say that the only thing I wish could be better is how to search for patients by previous encounters. Overall: The benefits greatly outweigh the disadvantages. I always have a peace of mind using this software with every use. I never have any issues logging in and if was to ever, resetting password is super easy. You have the option of resetting through a simple text to your phone or email with a 6 digit code to reset password. You can also access this software from anywhere in case you may need to adjust the schedule during non business hours. Comments: It's a relatively easy to use EHR, especially for practices who don't have a lot of complicated setup and need something affordable. Pros: Our billing company recommended this product to several of our offices who needed EHR but couldn't invest thousands of dollars. This was a great option for them at the free level. Now it is a paid subscription. It's still a reasonably priced version, but needs some enhancements to compete. Cons: Getting help was complicated--and getting enhancements implemented was also complicated. We had several clients ultimately abandon it when it became paid because they could get more features with other platforms. Pros: I think the system is visually easy to use and intuitive for the most part. They have excellent customer support and are very responsive. Also, it is difficult to beat the cost - FREE! Notes are easy to compose and creating templates or commonly used phrases (smart text shortcuts) are very simple and don't require too much effort. Cons: I have found it difficult to integrate with billing solutions that work for my small, solo practitioner office and it lacks any two way communication with claims clearinghouses/billers making a separate billing system (expensive and time consuming) mandatory. Also, in NC we are not yet able to use EPCS for controlled substances. In theory patients can complete intake forms prior to the new patient appointments, but the patient access system seems to have frequent problems and in the past 2 months has only worked about 50% of the time making paper records (and lost visit time) necessary. Recommendations to other buyers: This is an easy system to use for cash based practices and it has minimal time involved to get up and running. I like it overall, but would advise others to consider whether they will have a billing admin/support person in office to help with that aspect as otherwise it is too much time for a single-provider to manage. Our experience with PF is very good .. complete and very easy to use. Pros: Complete and very user-friendly. We have used this program since April of 2012 and it has served us very well. It is very easy to use. Even a newly hired staff can start using it right away. Cons: The PA module needs to be repaired. It is frustrating. The member's ID should be automatically posted from the member's insurance profile. The phone number formatting and autofill should coordinate. The saving does not work so I have to start all over again. Overall: We were able to satisfy the initial medical necessity requirement and collected the first incentive for the three doctors in the office. We need more help in pursuing the subsequent incentives for using the EHR. I started using this product whe I opened my own practice over 5 years ago. It serves my purposes! Pros: Most of it works well. They try to fix things and make them more user friendly. If you want a true review, don't ask people to make it a minimum number of characters. This is annoying. I wonder if this is eough characters yet. Don't make us work to appease you! Cons: Patient communications don't get to me . For example, I don't get verification that they will be there for their appointments. Also they try to change data on their accounts that doesn't come through. Somethings about it are still a bit awkward. Overall: I will continue to recommend this product unless I see a better one that is also free to use. Pros: Free but Practice fusion gets pain by vendors- xray, lab etc. they have e scribe which helped a lot and I did 95% of my prescriptions including narcotics but now I'm having a nightmare. Cons: I'm getting used to it but if you have a problem they have the worst technical support- no one seems to know the problem- no supervisor to talk to, no one knows how to fix, updating a license expiration date will messed up your e scribe and NO ONE can help. They want to change your expiration date thats different from your actual expiration date is the only advise they can give you. What a nightmare! I needed help, but it was not provided. Comments: Good product because it was free. Since I was not putting any money into the product, the company felt it should not have to put any time into providing in-house in service and education on the product. Which is too bad, because I would have liked to use it. Pros: The product was free. The product had a lot of a lot of uses for my clinic. Electronic prescriptions. Cons: Customer support was not very supportive. I had problems with e-prescription which were never resolved. The modules were okay. However, I wanted in-house training for me and my staff. I was told to watch the videos. Which means that no thought was given to the different type of learning styles that people have. Consequently, I had to find a different system that was responsive to the needs of my office and would schedule in-house training. 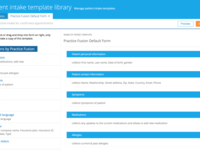 Practice Fusion is so easy to use and I create my own templates that fits my Chiropractic Practice. Pros: The ease of using this software and I get to create my own templates which I love. I have been using this software for over two years and it keeps getting better. Plus it's complimentary with CMS. Cons: I understand that information are being updated daily and it's hard for the folks to update everything on the site. There are still clicks that don't have the required informations that is needed. I'm sure it's coming! Overall: The streamline of my notes and the ease of using this program. I like customizing my notes based on my practice. The customer service is impeccable. I have already referred many friends to PF. Overall: Over the past 25 years I have tried almost a dozen systems in different settings. They all seemed to promise a lot, and delivered very little. I have used systems that cost over a million dollars for my small office, and many were tried in the $-$ range. I would gladly put Practice Fusion up against them all. It is great and it delivers exactly what they promise and they also provide the best customer support that I have seen in the EMR field. Recommendations to other buyers: All practices should give it a try. I have a dozen or more colleagues in this area that I have convinced to abandon their old systems and move to PF. They have and they too love it as do I.
worst of all, it is impossible to get in touch with someone from customer service. it was easier when it was free (and then not all that easy). What am i paying for? Have been on hold for 20 minutes and have moved up fromposition 19 to position 14. Who nowadays has the time for this? Pros: Practice fusion is a great EHR for the price. The layout is for the most part intuitive. It functions well for compliance with national mandates. The price is low compared to the majority of other EHRs. Cons: There are a lot areas where I wish I could click less. I have not found the template portion of the EHR very easy to use. I wish you could have dropdown menus and be able to tab through multiple choices for easy selection. Comments: I have used practice fusion since 2010. In the beginning, tech support was helpful and expedient. While there were many system fixes, in the beginning, they generally improved the situation. However, over the last several years, the tech supports has declined significantly. Even more frustrating is the ability to communicate with a supervisor to resolve issues. Most recently, there is an error in a drug called Belbuca, only approved for pain because Practice fusion feels that it is the same as suboxone!. Have tried to explain to many tech support, same pull down menu. A little better on the phone but no change in results. Ridiculous that this cannot be resolved. I have not looked back since i started this software easier to use very user friendly and practical. Recommendations to other buyers: 1 # billing portion need more work it is time consuming , should be able to have own template which can be check mark box instead of entering every thing again and and again , with space to write diagnosis code and procedure codes and super bill printable after that. 2# medication recon should be able to do more then one medicine at a time. Pros: Cheap, really easy to use, synopsis page, no need to download a program, online base system, patient portal with direct communication ( which helps reducing tons of phone calls). Obviously basic Emr features like rx, labs, fax, referrals. Cons: A lot of free typing, need for sections like hx surgeries, social hx, preventive with templates or justs clicks. Attachments can not be divided in categories. Addendums per sections not general. I HAVE BEEN USING PRACTICE FUSION FOR APPROXIMATELY 8 YEARS. I FIND IT TO BE VERY USER FRIENDLY. Pros: I LIKE THE WAY I AM ABLE TO SEE ALL OF THE PATIENTS VISITS WITHOUT LEAVING THE SCREEN I AM IN. THE SCHEDULE IS VERY EASY TO USE AND MANAGE. LOVE THE REPORTS YOU CAN PRINT OUT. AND LOVE THE WAY ENCOUNTERS ARE CREATED AND DROPPED. Cons: THAT YOU CAN ONLY HAVE FIVE PATIENTS OPEN AT A TIME. AND SOMETIMES I HAVE PROBLEMS IMPUTING NEW INFORMATION IN. Overall: EMR AND SCHEDULER ARE SO EASY TO USE, I ALSO LIKE THE DAILY REPORT THAT I CAN RUN, ERROR REPORTS , PATIENT REPORTS. I ALSO LIKE TO FUNCTION OF COPYING MEDICAL RECORDS, MAKE IT VER EASY FOR MEDICAL RECORD REVIEWS. Pros: I have been using this product for 3 years. Implementation was easy and the staff was wonderful. They are constantly upgrading the product to make it compliant with the never ending, government regulations. The help desk is wonderful. Having remote access on my cellphone is amazing and helps when patients call after hours. Cons: This is a cloud based system. It has gone down in the past, but the crew at Practice Fusion has made corrections very rapidly. The worst outage was related to general downtime from AT&T. Comments: When we started using Practice Fusion 8-9 years ago, it was incredibly well supported and functional for the time. However, over time it has had less and less support, and has had several episodes of downtime in the past year which were incredibly disruptive. However, it's the best system available for free in my opinion. Cons: It used to be very intuitive, but is a little less so now. It doesn't have the level of support that is needed for a FT practice. Comments: I have used Practice Fusion at two different offices. It is a free product and qualifies for the federal incentive programs. It is capable of completing all of the basic requirements of a physician's office. The providers did not have trouble using it and we still use it in one of our smaller offices. Pros: Free program, qualifies for the government programs, fairly easy for the providers to navigate. Cons: Cannot be used to do Rural Health billing. Support was more personal in the beginning, now most problems are handled by e-mail rather than speaking with a person. Practice Fusion has odd limitations and customer support does not resolve glitches quickly. Pros: The best part about Practice Fusion is it's free. I'm very excited that for 2018 we can submit Meaningful Use Data through Practice Fusion directly, which is going to save me a lot of time this year. Cons: The scheduler is inefficient - I pushed my company to use CollaborateMD (our billing software) for the scheduler because of how awkward and inefficient Practice Fusion is in this category. Overall: We benefit by having a free EMR that does electronically send superbills to our billing software (Collaborate MD). Comments: I have recommended it to several colleagues as the only way to go. Pros: We have been using PracticeFusion at our clinic for the past several years. Although it is designed for doctors, it is customizable so that we can use it with our psychotherapy clinic. It makes scheduling and charting simple and is always at my fingertips as I can access it anywhere. Cons: It's not specifically designed for therapists. It was designed with doctors in mind, which I'm sure makes a doctor's office a better fit. Cons: Some of the functions are not intuitive, such as where to click to find a desired task. The window where I write notes also has many sections that I don't need but am unable to clear away, thus limiting the space I do actually want to write my note. However, it's designed for a medical practice rather than for my needs (therapy). Overall: Have used in-house software, commercial (expensive) cloud-based software, and came to rely on Practice Fusion (PF). It is a cloud-based, template driven, a multi-platform software that is quick (depending on internet speed). Whereas other software requires you to use a single computer platform, PF works on Mac OS, iPad, as well as PCs. 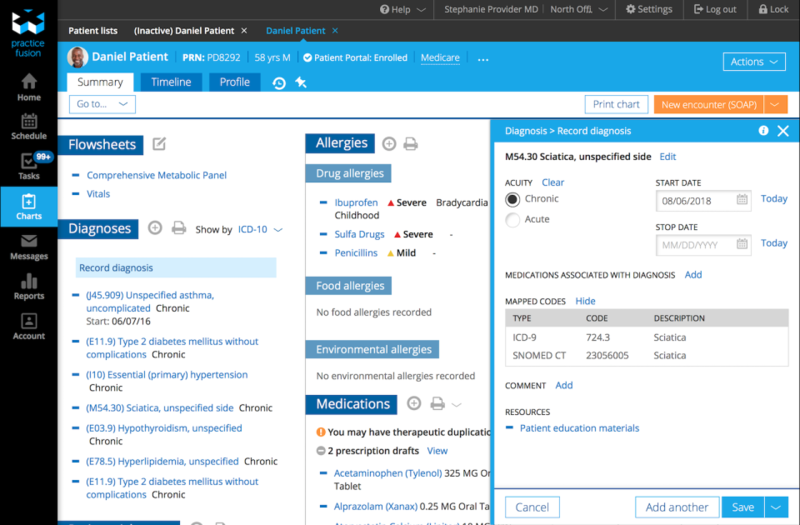 PF is also dynamic, no only are there multiple releases with new features each year, the user interface and templates can be modified on the fly to make patient charting quicker and more efficient. I highly recommend PF. Pros: It was free and even though it is now paid it is and EHR with great pricing. Cons: Prescriptions almost do not look real. 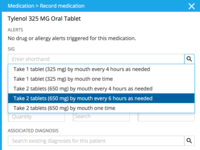 When writing prescriptions in this software even though printed on RX paper, the prescriptions look like anyone could have written the prescription. A lot of pharmacies in our area want to call and verify they are real. 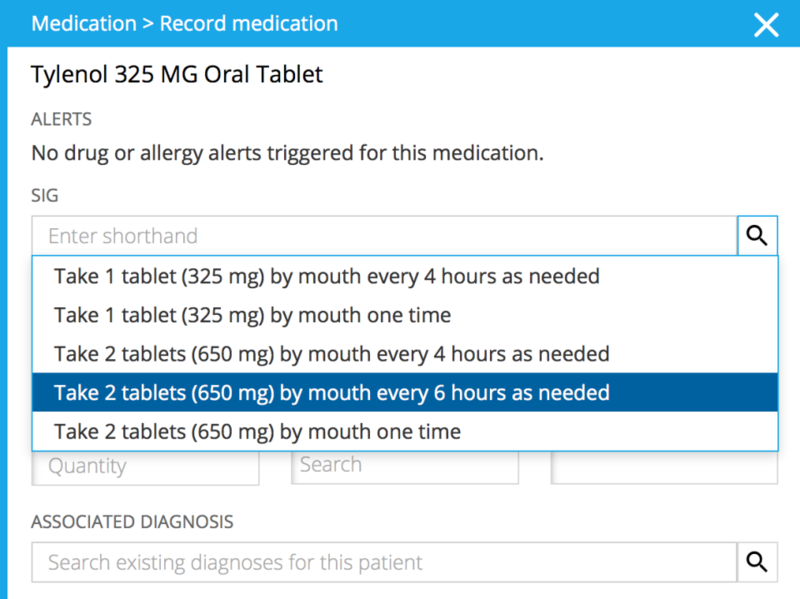 Overall: We use Practice Fusion in multiple Clinical Locations to document patient information. We have services offered aside from our traditional medical services that need to be documented but not in our regular EHR. 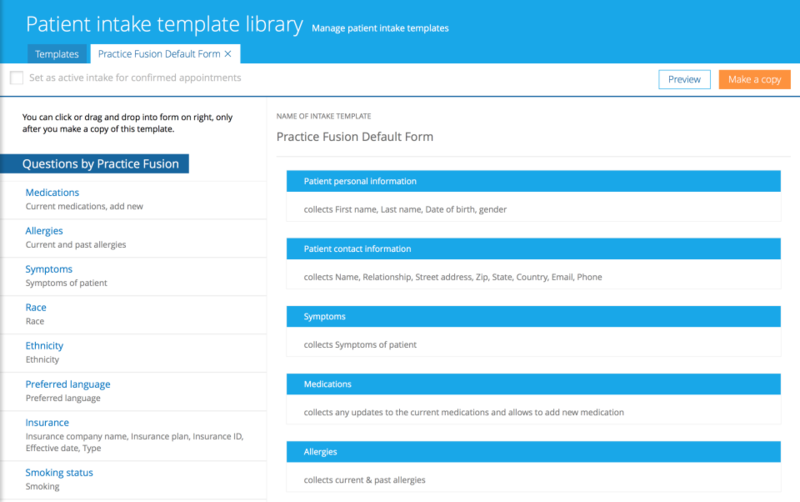 Practice Fusion is easy to use from scheduling to provider notes and a great tool for small clinics or clinics where multiple locations need a reasonable software.